Abatement Solutions Inc. offers commercial mold remediation services that can resolve any mold-related issues that your business may have. If you see signs that you have a mold problem, or you want to protect your Atlanta, GA, commercial property against future mold growth, our expert Certified Mold Remediation Contractors can provide effective solutions that will reduce the mold levels in your building to safe, acceptable levels, creating a healthy environment for you, your staff, and your customers. Containment – All of our work will be performed behind containment barriers and with air scrubbers utilized to prevent mold spores from infecting other parts of your building. Water extraction – Mold needs moisture in order to grow, so we’ll extract water and dehumidify areas as needed to deter future mold growth. Mold removal – We’ll clean mold-contaminated areas with an advanced, low-VOC peroxide cleaner and will safely bag up and dispose of any mold-impacted surfaces that need to be removed. Disinfection – Our team will apply SHOCKWAVE™, a powerful EPA-registered disinfectant, to destroy any remaining mold and ensure your business is a safe environment. Prevention – After completing your commercial mold remediation project, we can treat mold-impacted areas of your business with a preventative coating that will preclude future mold growth. We back this product with a 10-year warranty. 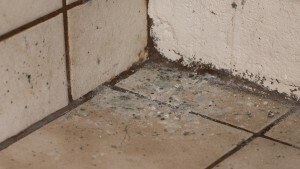 Also, if mold-impacted surfaces in your business need to be removed, we can either rebuild those items ourselves – things like drywall, flooring, and baseboards – or have them replaced by one of our trusted partner contractors, ensuring that your building is completely restored to its original condition when our work is done. For new construction, we also offer an extraordinary commercial mold prevention service using a protective coating called FortiCel™ on various surface areas to prevent mold problems from ever affecting your property. This remarkable product will block mold growth and comes backed by a transferable 25-year warranty, which can be a significant selling point to potential buyers of your property, if you ever decide to sell. In short, no matter what your commercial mold remediation needs may be, we’re the right company for the job. While some other companies may only offer mold abatement services in addition to their primary line of work, Abatement Solutions Inc. is first and foremost a mold remediation company. Having completed large-scale commercial mold remediation projects in the past, we’ve demonstrated our ability to handle any mold abatement jobs, big or small. Most importantly, we guarantee that after we complete our commercial mold remediation work you’ll receive a clearance letter from an independent testing agency stating that the mold problem is gone and your facility is once again a safe environment. Contact Abatement Solutions Inc. today for commercial mold remediation and prevention services that can safeguard your Atlanta, GA, commercial property against mold growth.